23/06/2007 — Acquisitions — Roubaix, Musée d’Art et d’Industrie and Lille, Musée des Beaux-Arts — Until last March and thanks to the artist’s heirs, the works of the sculptor Henri Bouchard (1875-1960) were displayed in the museum bearing his name located in his former workshop in Paris. After its closing, the works have fortunately found a home at the Musée d’Art et d’Industrie in Roubaix. A replica of the workshop, “identical in terms of volume and light” will be built and should open in 2010. 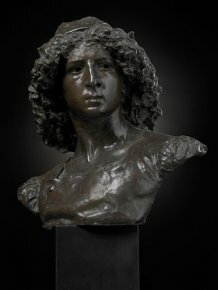 It was thus logical for La Piscine, the Roubaix museum’s other name, to pre-empt at Sotheby’s Paris on Tuesday, June 19, 2007, for 7,800 euros (including charges) a Portrait of the Sculptor Henri Bouchard by Carolus-Duran (ill. 1). The painting is dated 1906 and located in Rome where the sculptor worked at the Villa Medicis after winning the Grand Prix in 1901. At only 31, he seems much older in the picture. 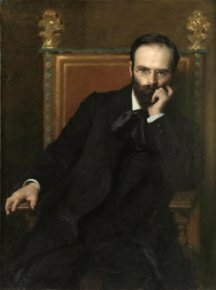 The serious expression, the black suit and the solid brown background together form a particularly austere work. A bronze by Carolus-Duran also joined a museum in northern France recently (2006). Lille acquired it from a private individual with patronage from the Crédit du Nord bank. The Pisan (ill. 2) had been on display during the retrospective devoted to the artist in 2003. Carolus-Duran made few sculptures. He participated in the Salon in 1873 with a portrait of his wife (bronze : Los Angeles County Museum of Art), that had perplexed art critics. The following year, he presented The Pisan of which there is also a terracotta version (private collection). The work, in its title and style, evokes Tuscan statues of the XVthC. and is in the neo-Florentine tradition practiced at the time by Paul Dubois (Le chanteur florentin) and Antonin Mercié (David). This is the first sculpture by Carolus-Duran for the Musée des Beaux-Arts in Lille which already owns a large collection of his paintings.